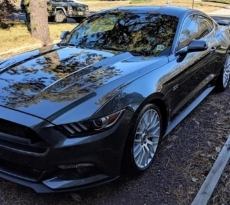 This Mustang of the Moment goes to Mustang6G member Josh (MiDiablo) and his 2015 Mustang EcoBoost. 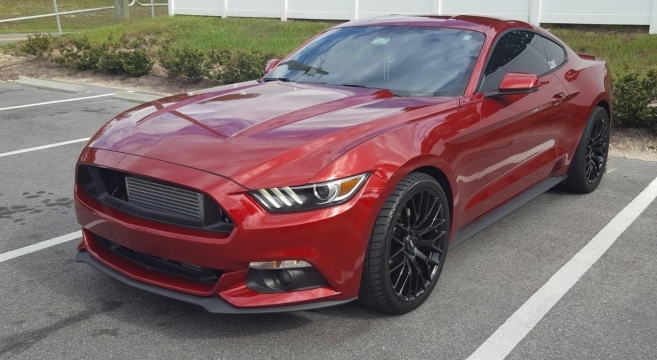 Due to an addition to the family, Josh inherited this Ruby Red 2015 Mustang EcoBoost from his wife and has since turned it into a V8-rivaling beast on both the street and drag strip. 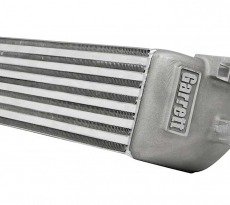 This four-banger S550 has a long list of go-fast parts including MAP intercooler, Cobb Accessport, UPR catch can, Tune+ Turbosmart Internal Wastegate, JLT cold air intake, WMS catless downpipe, Race Core Intercooler from Levels Performance, E30 tune from Tune+ and a set of American Muscle PP Rep wheels wrapped in Mickey Thompson ET Streets. 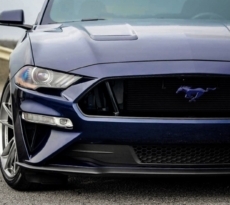 The aesthetics were also improved with a GT grille delete, and on the interior, GT350 push button start, carbon fiber steering wheel pony and red pony plaque overlay and a large “EB” dashboard badge from UPR Products. Check out Josh’s 2015 Mustang EcoBoost build journal in our forums.